The da Vinct®h Surgical System is a master-slave robot system, which provides a magnified, three-dimensional image with wristed instrumentation. The current system has four arms, one for the binocular endoscope and the other three for the articulated instruments. Essentially, the bipolar Maryland tip grasper replaces the long tip forceps, bipolar cautery, and one needle driver, and the cautery scissors replaces the round tip scissors and the cautery hook. 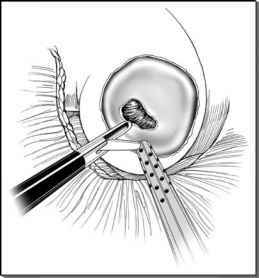 This will decrease the cost of disposables, but the anastomosis is slightly more cumbersome. Conventional laparoscopic instruments are used by the two assistants. The left-sided assistant uses an atraumatic grasper and manipulates the Foley when necessary. The right-sided surgeon uses an atraumatic grasper, scissors, a Surgiflex® WAVE XP™c suction-irrigation system and a needle driver.